The Coyotes on Sunday recalled forward Jordan Szwarz and assigned defenseman Connor Murphy to the Portland Pirates, the team’s American Hockey League affiliate. Szwarz has played 20 games with Phoenix this season, scoring two goals. The 22-year-old also has four goals and three assists in 12 games with Portland. 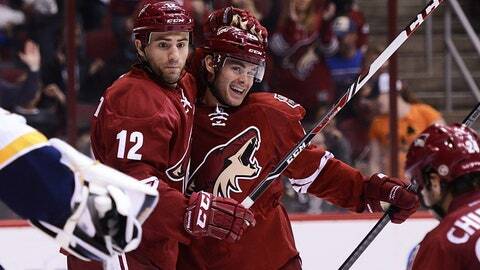 The 20-year-old Murphy has played 21 games with the Coyotes this season, tallying a goal and seven assists. The 2011 first-round pick has struggled of late, however, and Phoenix has an abundance of blue-liners available even with Zbynek Michalek’s absence due to a hip injury. Murphy has played 12 games in Portland this year, posting four assists.